Lessons for Jerusalem: First, don’t count on Washington. Americans watch our tragedy-of-errors Syria policy from the safety of houses and apartments in suburbs and cities 5,000 miles from the conflict. Israelis are next door, and two weeks ago​—​when an American strike and possible Syrian counterstrike at Israel seemed imminent​—​they were lining up for gas masks. There are no such lines in Tel Aviv today. But what can Israelis make of the Syria crisis now, after the Obama speech and with action moving to Geneva and to the United Nations? What are the lessons they may learn? Israel has maintained decent relations with Russia throughout the Putin years, under the Sharon, Olmert, and Netanyahu governments, and the lesson here is that this was a smart move. It turns out that Vladimir Putin and Russia remain important players in the region after all, not just by selling arms to Syria but at the U.N. as well. Issues like Iran and Syria can play out in part in Moscow and in part in Turtle Bay, and being able to communicate directly with Putin and foreign minister Sergey Lavrov​—​in a relationship separate and independent from that of the United States​—​helps protect Israel’s interests. Watching Obama and Kerry fumble and change positions as Putin and Lavrov seize opportunities and play the game like professionals must teach Israelis that keeping a line open to Russia is smart. The outgoing commander of the IDF’s Air Defense Academy met with the IDF Website and provided some amazing insights into the apparatus that keeps Israel’s skies safe from enemy rockets and works towards healing Israeli society at the same time. In this second part of the three-part series, he talks about what it takes to train the "Facebook Generation" to fight. Israel’s air defense apparatus has grown and developed at a rapid pace in recent years. In November 2012, its astonishing capabilities were brought to the full attention of the Israeli public and the international community during Operation Pillar of Defense during which terrorists in Gaza fired over a thousand rockets at southern and central Israel. In eight days of conflict, the Air Defense Command’s newest missile defense system – the aptly named Iron Dome - succeeded in shooting down more than 400 terrorist rockets that threatened to strike populated areas. On the eve of PA President Mahmoud Abbas’s speech at the UN General Assembly, a number of Palestinian groups called for launching a third intifada against Israel. The calls were issued in protest against visits by Jewish groups to the Temple Mount. Hamas’s armed wing, Izaddin Kassam, also threatened to resume suicide bombings against Israel. A7 interviews Phyllis Chesler, whose new book "An American Bride in Kabul" is a fascinating account of her life in the Sharia-controlled Muslim world - one from which she barely escaped with her life, but which has begun to flourish in the USA. Fern Sidman, a free lance writer, served as Arutz Sheva's NY correspondent and is currently an editor at the Jewish Voice. Dr. Phyllis Chesler, internationally renowned pioneer feminist, professor, psychotherapist and prolific author and op-ed contributor to Arutz Sheva has a feverish schedule these days. On October 1, her latest book entitled, "An American Bride in Kabul" is scheduled to be released and the pre-publication copies have caught the attention of the media. As she juggles interviews with major outlets and plans an international speaking tour, Dr. Chesler, sat down with Arutz Sheva in her very first interview to discuss her compelling memoir; both a personal narrative and scholarly monograph and written in her spellbinding and flowing style. Chesler, brought up in an Orthodox Jewish home, eventually returned to her roots and is able to look at her period in Afghanistan with discernment and objectivity. This is a book whose time has come. Syrian Rebels Say: We Demand Radical Islamism; U. S. Says: We Can’t Hear You! I’m not there – I wish I was… but today, there are over 30,000 Jews in our ancient and modern city of Hebron, beside the Cave of the Patriarchs. It is documented in the Bible, perhaps the longest living real estate transaction in history. Abraham bought the cave as a burial place for his wife; there he was buried. His son Isaac is buried there, as his wife Rebecca. Their son, Yaakov, is buried there… and his wife, Leah. Most years, going to Hebron on the joyous holiday of Sukkot. We have so many holidays that are serious, that brings us to tears…this is one of fun and joy and most Jews just love this holiday. And each year, tens of thousands of Jews take one of these days and go to Hebron… it is an incredible journey to our forefathers – and they are there waiting for us. The reviews are in for Obama’s UN speech from Israel and they aren’t good. The politicians were particularly outraged by Obama’s statement that Israel’s security as a Jewish and democratic state depends on the realization of a Palestinian state. One of the two - 20 years of age - was murdered by his Arab co-worker in a restaurant who was supposedly 'a friend' yet lured him to a place where the horrendous act took place. Miftah is against peaceful co-existence. Do its funders know that? Among the organizations that are funded by the Anna Lindh Foundation are The Abraham Fund, "to promote coexistence and equality among Israel’s Jewish and Arab citizens." It also fundsPeacePlayers International, which "uses the game of basketball to facilitate positive relations and peaceful coexistence between Israeli and Palestinian communities – in short, to bridge divides, change perceptions, and develop leaders who will advocate for a shared future." The Konrad Adenauer Program for Jewish-Arab Cooperation is associated with Konrad-Adenauer-Stiftung and is meant "to deepen the knowledge and understanding of Jewish-Arab relations in Israel through conferences, public lectures and workshops, as well as research studies, publications and documentation." Uh-oh. Does the CuBox-I computer go on the boycott list or not? The next revolution in personal computing could very well come from the northern Israeli town of Yokne’am, where SolidRun…has developed a $45 PC that can do almost anything a “big boy” computer can do – with all design and manufacturing done in Israel. The Cubox-I can be used for all sorts of things a regular PC can be used for – dedicated or general purpose – and save loads of energy, because it can replace computers that require a lot more power. So the Israel-haters will want to ensure that this product is boycotted, right? The company is run by, and the computers manufactured by, Israeli Arabs. If it does, then the boycotters are hurting “Palestinians,” and they are proven to be hypocrites. In time for the Jewish calendar’s fall holiday season (Jews around the world are celebrating Sukkot—the feast of tabernacles—this week), today’s New York Times took up the delicate issue of Jerusalem’s Temple Mount where, we are told, troublemaking Jews are breaking the rules and making coexistence, if not peace, that much more difficult. Since some Jewish extremists do foolishly dream of replacing the mosques that are atop the Mount (which looks down on the Western Wall) with a rebuilt Third Temple, a scheme that would set off a religious war no sane person would want, Israel has always sought to keep the peace in the city by limiting Jewish visits and prohibiting Jewish prayer there. So with increasing numbers of Jews wanting to look around and perhaps even surreptitiously utter a prayer, the conceit of the Times piece appears to be that this is just one more instance in which Israelis are giving their Arab neighbors a hard time and pushing them out of a city that is sacred to the three monotheistic faiths. No emotional dissonance for me on the situation with the PA/PLO. The emotions I feel are anything but positive, but I am unconflicted. Deputy Minister of Defense Danny Danon (Likud) has been calling it straight. On a tour of the Temple Mount, Yehuda Glick shows religious Jews a diagram of the Jewish temple, which once stood where the golden Dome of the Rock stands today. Behind him rise the two sites that make Jerusalem the third-holiest city in Islam: the Al-Aqsa mosque and the golden Dome of the Rock, a Muslim shrine commemorating the prophet Mohammed's ascension to heaven. It is built on the spot where Jews believe the very presence of God once rested in the Jewish temple. This is considered the holiest place in Judaism, yet it has been largely off-limits to Jewish worshipers because of concerns that range from violating Jewish law to provoking riots. "I was taught... our enemy is Satan, Zion with a tail"
"Our enemy is Satan, Zion with a tail." The lyrics of the poem, which were written by Egyptian poet Hesham El-Gakh, promote Pan-Arabism and explain that the speaker "has been taught" that "our wars" are religious in nature, being fought "for the Al-Aqsa Mosque" and that the enemy is Jews - "Zion, Satan with a tail." Twice before, PMW documented that official PA TV had young children recite this hate speech. "Moadim L'Simcha" (times of joy) is the traditional greeting for the intermediate days of Sukkot. And, yes, I've heard it many time these past few days. Personally, I have been finding it to be an especially lovely Sukkot -- with family gathered in the sukkah amidst laughter and singing. And not one, but two visits to the Kotel. But each time within the last week that I have turned away from the holiday celebrations to familiarize myself with the latest news, all joy has fled, replaced by a sense of horror and immeasurable weariness. Emotional dissonance: To balance the disparate emotional responses (somehow) requires the skill of an emotional gymnast -- a skill I seem to be lacking. A former C.I.A. officer calls Suleimani, the head of Iran’s Quds Force, the “most powerful operative in the Middle East today.” Illustration by Krzysztof Domaradzki. Last February, some of Iran’s most influential leaders gathered at the Amir al-Momenin Mosque, in northeast Tehran, inside a gated community reserved for officers of the Revolutionary Guard. They had come to pay their last respects to a fallen comrade. Hassan Shateri, a veteran of Iran’s covert wars throughout the Middle East and South Asia, was a senior commander in a powerful, élite branch of the Revolutionary Guard called the Quds Force. The force is the sharp instrument of Iranian foreign policy, roughly analogous to a combined C.I.A. and Special Forces; its name comes from the Persian word for Jerusalem, which its fighters have promised to liberate. Since 1979, its goal has been to subvert Iran’s enemies and extend the country’s influence across the Middle East. Shateri had spent much of his career abroad, first in Afghanistan and then in Iraq, where the Quds Force helped Shiite militias kill American soldiers. PM's decision comes hours after Palestinian sniper attack in West Bank city; decision expands the Jewish areas of Hebron to include an Israeli civilian presence in a Palestinian area next to Cave of the Patriarchs. Iconic British musician Roger Waters launched an education resource on the Israeli-Palestinian conflict in Dublin this week, an Irish solidarity group said. Mr Waters told a packed audience in Dublin that he "wholeheartedly endorsed" a teaching pack entitled 'Palestine & Israel – How will there be a Just Peace? 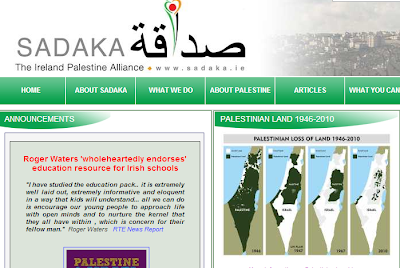 ', which was co-produced by Sadaka – the Ireland Palestine Alliance. The resource is the first curriculum approved teaching module on Israel/Palestine in the Republic of Ireland and Northern Ireland, and provides a critical analysis of the conflict in a context of human rights. "I have studied the education pack... and it is extremely well laid out, extremely informative and eloquent in a way that kids will understand," Waters said. Marie Crawley, chair of Sadaka, said that Waters' endorsement of the pack is "immeasurable in its importance and will be hugely influential with young people around the country as we encourage schools to use this resource." 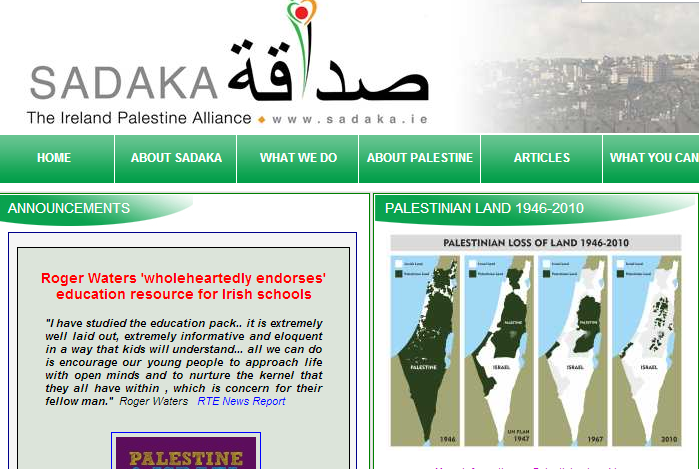 The home page of Sadaka includes The Map That Lies, just so you know what Irish students are in for. The curriculum itself pretends to be even-handed. It is pretty much what Israel haters would consider even-handed, without actually subjecting themselves to the opinions of mainstream Israelis. Tel Aviv — Israel routinely gets crucified by its enemies, not least for the behavior of the Israeli military. The Jewish state’s reckless soldiers eagerly spill Arab blood, as if for sport. Or so the story goes. While you might think that this is part of the Syrian Civil War between Sunnis and Shiites as most Palestinian Muslims are Sunnis and Hezbollah is a Shiite Islamist terror group, the truth appears to be even more ironic. A Palestinian was killed and five others wounded in a clash between Hezbollah members and Palestinians in Burj al-Barajneh, south of the capital Beirut, the Al Jadeed TV reported. The report said that a number of Palestinians refused to be searched, and then opened fire on a Hezbollah checkpoint near the Burj al-Barajneh Palestinian refugee camp. Local media said the skirmish broke out between Hezbollah and a group of Palestinians celebrating a wedding. They said the brawl quickly developed into an armed clash when the wedding convoy refused to be searched by Hezbollah. LBCI TV reported that protesters burned tires at the camp’s entrance and shouted anti-Hizbullah slogans in the wake of the clash. Hezbollah had beefed up its security measures in and around Beirut’s southern suburbs in the wake of a powerful car bombing that rocked the Rweiss neighborhood in Dahieh and left 27 people dead and around 300 wounded. 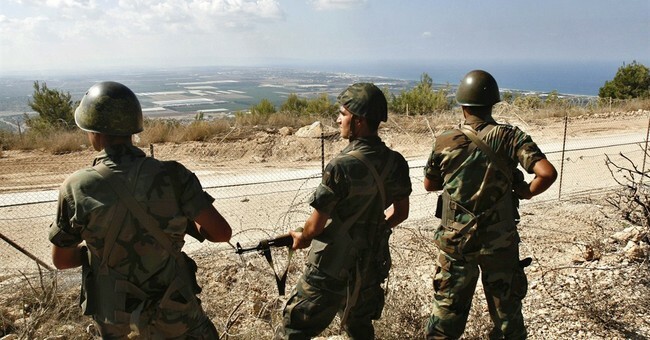 Hezbollah security measures angered many Lebanese leaders. The competing Arab claims also submitted at the Paris Peace talks were implicitly denied in Palestine, but recognized in the rest of the Middle East, i.e. Syria & Mesopotamia and, indirectly, later in Transjordan. The Allies had conquered this area from the Ottoman Empire in a defensive war. Their ruling was based on the historic association of the Jewish People with Palestine (the name given to the area by the Romans) in which there had been a continuous uninterrupted Jewish presence for 3,700 years.